The claim that it might help with male pattern baldness seemed like a total scam… until we dug into the South Korean study. Using cultured human dermal papilla cells, they reported that this unique form seemed to inhibit DHT. Why that’s so interesting is because DHT plays an important role. 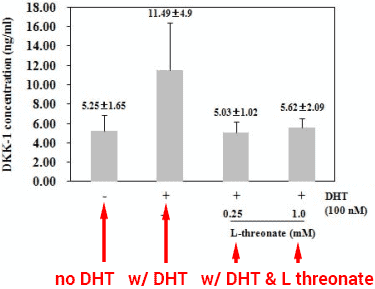 Lowering DHT happens to be the active mechanism of Propecia. The theory of hair loss benefits is not proven, but it at least seems plausible after reviewing the research. What is magnesium L threonate used for? According to the message boards and blogs, hair growth appears to be the least discussed topic. 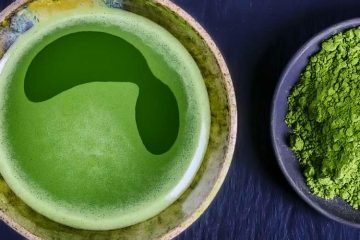 You hear of people claiming to use threonate for sleep, anxiety, and as a nootropic (brain enhancer). Some cite animal research involving mental health. Even the respected Dana Foundation, which is a New York philanthropic organization that’s been focused on brain health since 1950, has talked about it on their website (1). While making no claims themselves, they do cite a prominent scientist who claims being magnesium deficient has been linked to “depression-like behaviors” in mice. Mr. Liu is also 1 of the 2 inventors listed in the following U.S. patent application for Magtein, which is the brand name it goes by. 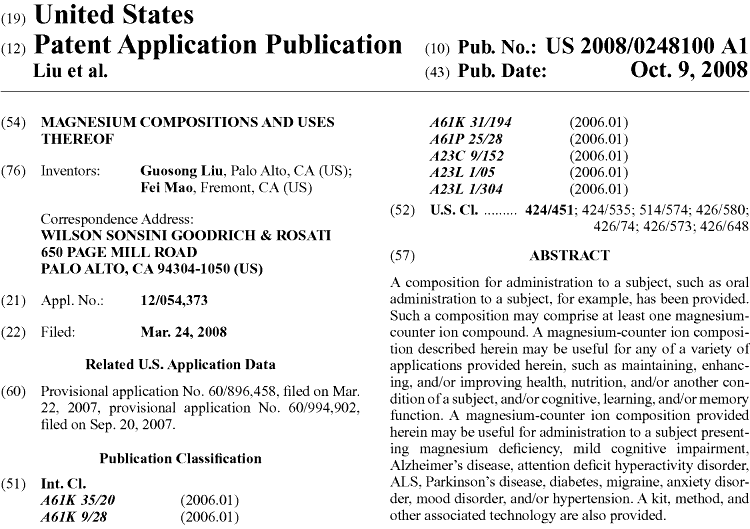 That particular patent is from 2008, but this form of magnesium was invented or discovered years prior. It looks like it took some time to figure out what health benefits if might be used for. The first piece of research in the PubMed database about it is from 2003, in Chinese (2). In 1997, a Chinese patent was filed about L-threonic acid. It’s not specific to magnesium though, as they also talk about combining it with other minerals like potassium, sodium, ammonium, zinc, and iron (3). As you can see above in the 2008 patent, the inventors propose that it might be useful for Alzheimer’s disease, Parkinson’s disease, amyotrophic lateral sclerosis (ALS), ADHD, high blood pressure, migraines and even diabetes. To be clear though, these are just theories. Those, as well as all the other proposed benefits discussed so far, are only theories which have been put forth. None have been proven. 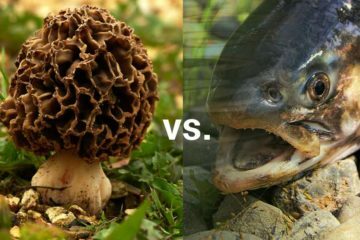 Before rather than jump to conclusions again, we decided to do an exhaustive analysis of the science. The Cliff’s Notes are below for your convenience. Magnesium threonate is a chelate, which means it’s a metal attached to an anion (negatively charged group). 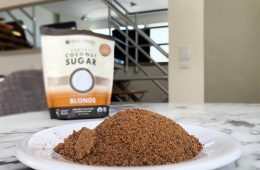 Basically it is magnesium attached to L threanoic acid, which is a sugar acid that comes from vitamin C.
Magnesium is one of the essential macrominerals. Unlike trace minerals which are only needed in tiny amounts, your body requires a relatively large amount of this and others, like calcium and potassium. The Recommended Dietary Allowances (RDAs) for magnesium increases slightly with age. Adult males under 30 require 400 mg and for women, 310 mg. From 31 and onward, the amounts go up to 420 and 320, respectively. Many people get adequate amounts from diet alone, but those with GI diseases like gluten-sensitivity, Crohn’s disease, and IBS can suffer from deficiency over time (4). That’s about our needs of the mineral in general, not any specific form of it. You can buy it as a supplement in many different forms. 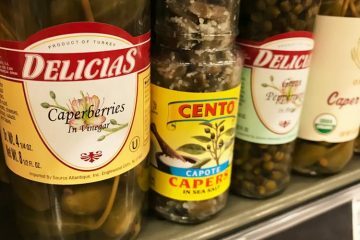 Why you would choose it attached to L threanoic acid – which is a very expensive version – only makes sense when you compare and contrast it to the others. What is the difference between magnesium L threonate vs. magnesium citrate? The latter is citric acid that’s bound to the metal, to create a salt. 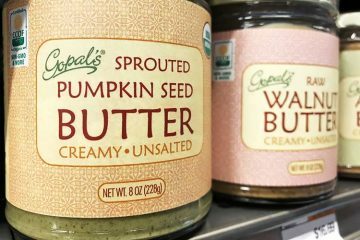 In high concentrations, it’s used as a laxative prior to surgery to empty the bowels… not exactly something you want to supplement with. 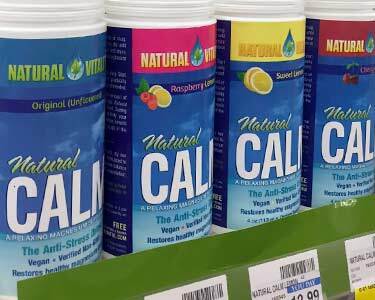 Natural Calm drink is marketed as being anti-anxiety, but does the citrate version it uses easily travel to the brain? There’s not proof of that. Unlike magnesium citrate, the threonate form easily crosses the blood brain barrier. This is something which was demonstrated in the MIT study (more on that in a minute). Magnesium oxide, orotate, taurate, malate, glyconite, carbonate, and chloride forms can’t make the same claim. Or at least if they do easily cross through, there aren’t studies to suggest it. How long does it stay in your system versus the others? The half-life of magnesium L threonate is not something you can easily measure, like a pharmaceutical compound which is broken down by the liver. Because while it’s true the magnesium ion can be separated from the L-threonic acid, you can’t break it down any further than that. So measuring the half-life of how long that magnesium stays in your body would be difficult, since there are plenty of those ions already in your body. Very little research exists on this newly discovered form. In the NIH’s database of nearly 30 million pieces of medical research, fewer than 20 even mention it. A total of four Mg L threonate clinical trials are registered and can be found in the ClinicalTrials.gov database. The only completed trial is for people with dementia. It was conducted at Stanford University and the study was completed less than a year ago (5). Seniors 60 and older participated. A total of 1,800 mg were taken per day, in the form of Magtein capsules. In the morning, one 600 mg pill was taken. 2 before bed, two pills were taken equaling 1,200 mg. This dosage was used for 60 consecutive days. Magnesium L threonate for ADHD. Healthy adults 18 to 55 years old who have had childhood-onset ADHD or the disorder diagnosed in adulthood. Those on Adderall and other medications are eligible. It’s planned to be a 12 week trial but the dosage isn’t listed in the filing (6). Another for people with XMEN syndrome. No, that doesn’t mean you’re a superhero… it means you have X-linked immunodeficiency with magnesium defect, which makes it hard to fight bacterial and viral infections. 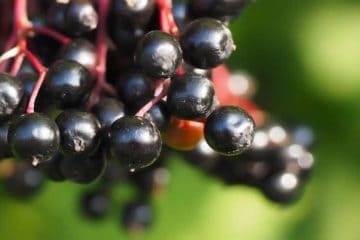 They’re looking to see if this supplement can boost the immune system for XMEN syndrome sufferers with Epstein-Barr virus infections. The sponsor of this one is actually the US government; National Institute of Allergy and Infectious Diseases (NIAID) (7). Northwestern University is recruiting for schizophrenia. They’re looking for 60 people to conduct a randomized, placebo-controlled, and double-blind clinical trial. Their test dosage of magnesium threonate for schizophrenia is not disclosed in the filing (8). There have been a handful of animal studies, but only one human trial published so far (9). It was not registered with ClinicalTrials.gov. The early-stage pharma company Neurocentria conducted it, along with the help of Ohio State University, University of Southern California, and Tsinghua University in China. The latter was included because that’s where Professor Guoson Liu works. Adults 50 to 70 years old with cognitive impairment participated. 23 people were given magnesium L threonate capsules, while 21 received placebo. Dosage was linked to body weight; approximately 25 mg of the supplement per kg of body weight. As a result, two dosages were given of 1,500 mg per day or 2,000 mg per day. Daily usage continued for 12 weeks. PSQI is a self-rated questionnaire for sleep quality. HAM-A is a rating scale for affective personality. Is magnesium L threonate safe? 20% (5 of the 25) getting the supplement had digestive issues. 15% (4 out of 26) getting placebo had them. Prior to that human study, all the hype revolved around a 2010 rat study (10). Since then there have actually been other exciting animal studies, but because the MIT study for magnesium L threonate was first, it remains the most cited. The school’s Department of Brain and Cognitive Sciences proposed that higher amounts of magnesium in the brain boost working memory and learning abilities, at least in the rats they tested. Synapses are where neurons connect to one another. The average neuron has something like 10,000 connections and it’s believed the more they have, the better… because there is more efficient processing of information between them (11). Each synapse is like a road in the brain. The more roads leading somewhere, the easier it is to transport to and from that location. What synaptic density refers to is how many connections there are. As we age, we experience decay of these connections; a lower density. When you’re younger, you have a higher synaptic density. In this MIT study, the scientists observed higher synaptic density during the magnesium threonate dosage. Two weeks after the mice stopped taking it (MgT off) their density returned to what it was before (control). These charts show the quantitative analysis of the density (B & C) and improvement in short-term memory (D) based on the Novel Object Recognition Test. That seems logical, because the younger would already be expected to have higher synaptic density to begin with. In comparison, no one talks about these others which are equally – if not more – intriguing than the MIT study. A 2011 study which claimed that when rats were treated, it seemed to reduce fear memory, but not by impairing the original fear memory (12). 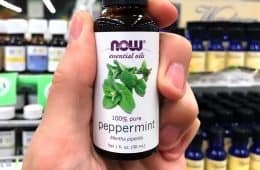 Might that mechanism be why some use magnesium threonate for anxiety? Perhaps it’s even related to the purported benefits for sleep and insomnia. If those are for real, it’s often fear and anxiety that keeps you tossing and turning at night, right? 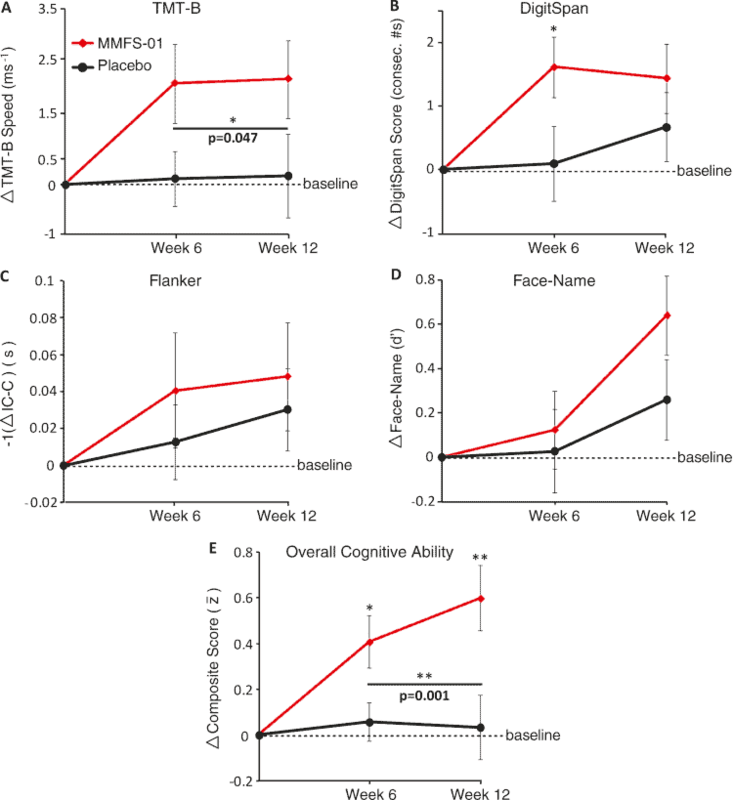 The 2014 Alzheimer’s disease mouse model (13). They found that elevating brain magnesium levels reduced the amyloid plaque areas by up to 35%. There is dispute as to whether or not amyloid is a cause of Alzheimer’s, but it is agreed that a greater presence of these plaques correlate with the disease. It’s a chicken and egg conundrum… is the Alzheimer’s causing amyloid plaques? Or are they merely a side effect of the Alzheimer’s brain? In 2015, a similar study suggested that magnesium ions reduce neuroinflammtion and amyloid plaque precursor proteins (14). There’s 2016 research which observed stem cell proliferation in both young and old mice, when they were supplemented with higher levels of brain magnesium (15). Might it help hearing loss or tinnitus a.k.a. ringing in the ears? That possibility is what a 2017 study out of the UK inferred (17). Following a session of acoustic over-exposure, they found that treatment with magnesium threonate helped to restore synapses in mice, in the dorsal cochlear nucleus (DCN) of their brainstem. The called that “early therapeutic intervention” which is not the same as if the mice had prior damage from long ago. Benefits of magnesium L-threonate for tinnitus or hearing damage in the past was not part of this experiment. What has NOT been studied? 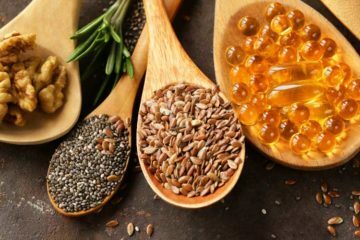 It has been proposed that upregulation of NR2B in the brain – which enhances synaptic activity – may be boosted with healthier magnesium levels. Only one published paper on this topic has called out Parkinson’s and depression as possible benefactors of this mechanism, and only indirectly at that (18). On PubMed, you will find nothing about it being studied or even theoretically helping epilepsy or obsessive compulsive disorder (OCD). It is true that outside of formal research, you have some claiming you should use magnesium L threonate for GABA (gamma-aminobutyric acid). GABA is an inhibitory neurotransmitter which is believed to have an anti-anxiety effect. Dr. David Jockers website claims that it is “by far, the most effective form” for raising low levels of GABA. However that hasn’t been validated in research, so it remains a theory. It has been suggested that magnesium plays a “critical role” in headaches, seizures, and other neurological conditions, but that hasn’t been proven either (19). Speaking of which, measuring headaches and migraine activity in animal models is near impossible. There is intriguing research about this unique form which can cross the blood brain barrier. 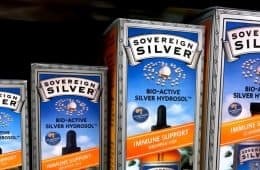 But with only one human study published, it’s really impossible to claim any unique benefits for magnesium threonate. At least for now. The one benefit you can claim today is that it’s a form of an essential mineral. For that reason, maybe it’s best to kill two birds with one stone and buy magnesium L-threonate with calcium and vitamin D3, so you get multiple essential minerals and a vitamin. It’s not available as capsules or tablets, but you can buy Life Extension Neuro-Mag powder on Amazon which contains all 3 of those ingredients. 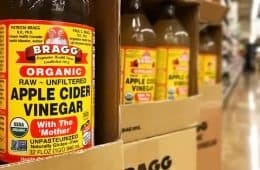 Supplementing with that seems like a better idea than magnesium oxide, which has a strong laxative effect. Likewise for magnesium glycinate, taurate, and citrate. Those aren’t known for having much of a laxative effect in low doses, but they seem like inferior choices given the blood brain barrier data. If you can afford the best magnesium, why bother with the others? 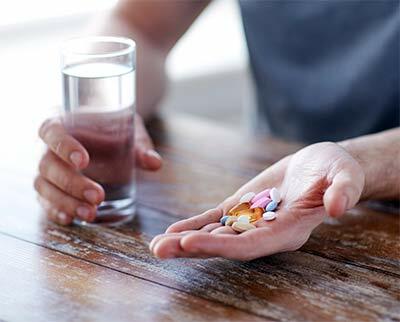 How much magnesium L threonate should I take? As with other forms, you may see product reviews of it causing diarrhea or loose stools. That can happen with any brand or form of this mineral. That’s why it’s important to follow a manufacturer’s recommended maximum dosage. Typically, that involves 3 capsules which are split into 2 different dosages; 1 capsule in the morning and 2 at night. An overdose of any form is more likely to cause diarrhea and other side effects. Especially when you first begin supplementation. The best time to take magnesium threonate will be on an empty stomach, if you can handle it. This is because it may compete with other minerals for absorption. Though taking it with food is fine too and starting out, that could be preferred as your digestive tract gets accustomed to it. 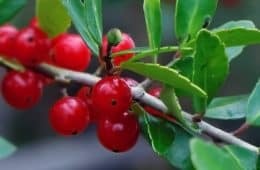 Those with kidney disease may be at increased risk when using any form of this mineral, since it is the kidneys which are responsible for excreting it. As with many supplements, risks are unknown. Pregnant women using magnesium L threonate haven’t been studied. In the GRAS filing for the supplement, they only cite calcium L threonate being studied in 20 pregnant mice, not humans. No reproductive harm was observable at daily dosages of up to 6,000 mg per kg of their body weight. That’s probably the closest thing you will find on the topic of pregnancy and breastfeeding (21). Not specific to pregnancy, the European Food Safety Authority (EFSA) says the calcium form appears safe to use as a supplement, but they haven’t commented on the magnesium (22). Not everyone can sell this. Similar to ubiquinol (the preferred form of CoQ10) this is a patented supplement that is only licensed to a handful of companies. 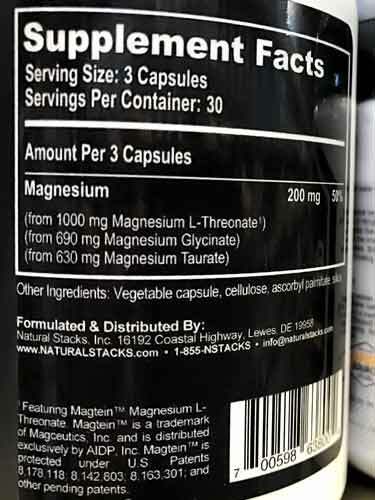 Natural Stacks Magtech may sound different, but look at the bottom of the label and you will see it contains the patented Magtein. Whether a bottle says Magtein (the brand name) or not is irrelevant, because that’s just the trademark used by the parent company (Magceutics/AIDP). 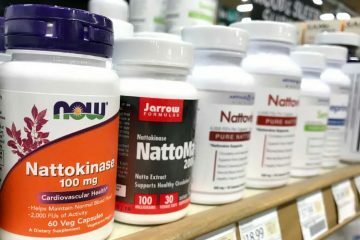 Some supplement manufacturers like NOW Foods, Source Naturals, and Life Extension will print the Magtein name on their label front and center. 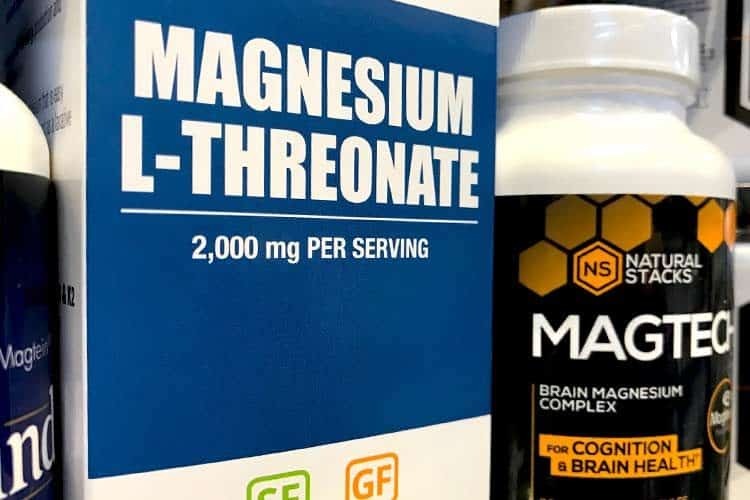 Other brands, like Dr. Mercola magnesium L threonate, prefer to be more incognito – they say Magtein on the back label in tiny text, while the front is all about the Mercola name. Don’t worry about whether or not the Magtein name is used. All legitimate products are selling the same patented formula. Whether or not these companies even manufacturer it themselves isn’t disclosed. 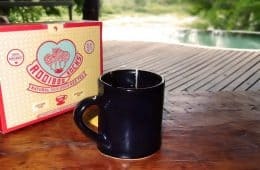 With ubiquinol, it’s all manufactured by Kaneka, who sells it to companies like Jarrow Formulas and Doctor’s Best to slap their label on. That might be what’s going on here. For example, Jarrow Formulas MagMind magnesium L threonate sounds like a product exclusive to them. But then you read the supplement facts fine print… it says Magtein. They’re just re-branding it as MagMind to try and differentiate themselves from the competition. Life Extension does the same thing by calling it Neuro-Mag. With a proprietary ingredient like this, the brand name shouldn’t concern you as much. The best magnesium L threonate supplement will be whichever product is lowest cost, in the form you want (bulk powder, capsules, or tablets), and from a brand you trust to not cut corners or do other unscrupulous things. However be warned that only a couple of these brands offer magnesium L-threonate without magnesium stearate. That’s a “flow agent” which helps the capsules move smoothly through machinery, without sticking. This lubricant has no known health benefit and some allege that the stearate is toxic. The brands without it can be pricey, but worthwhile. Our top recommendation? Pure Encapsulations CogniMag. It contains no magnesium stearate or artificial additives. It’s non-GMO, gluten free, and allergy friendly. You can get it on Amazon. 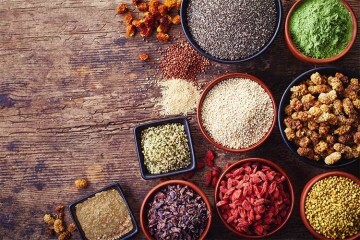 Where can you buy magnesium threonate? Places like CVS, Costco, Walgreens, and Walmart only have basic selections for supplements. The specialized higher-end things like this you’re unlikely to find there. In the UK, Canada, and Australia, you will probably have to order online. In the United States, the only nationwide chains you might find it are Whole Foods and Vitamin Shoppe. GNC could have it, but they do tend to focus more on fitness and weight loss. For bulk powder, we haven’t seen it at any store location. Try Amazon or Vitacost for that. No one makes it in a liquid form, but stirring a serving of the powder in a glass of water would be fairly comparable. Do you know if magnesium l-threonate also helps with muscle twitching and anxiety? What’s strange is every once in a while if I eat red meat the twitching and anxiety goes away but I rarely eat meat and have PTSD from the military. I have tried too many meds from the VA and getting sick of addiction and the muscle twitching from anxiety Thanks in advance! Trust me, this will help you. My mother had anxiety and used pills for it too, now shes of the pills and this magnesium saved her from the almost every day strong anxiety attacks. I buy mine from Sabre Sciences that have unique formulation that works a lot better than other products I have tried. I use the I-MagT Powder. Please, I am truly fighting for my life…Your comments and experiences could save me…I need your help! 10 doctors in Germany and no one knew what to do for me…I came back to the U.S. in the Fall of 2018, and 4 doctors later, no one knows anything about this drug addiction and every blood test shows absolutely nothing wrong with me. I tell them what I am suffering from, but “we don’t know anything about that” – and I am sent on my way to suffer alone. 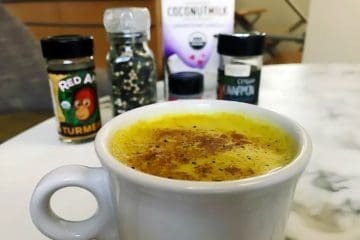 I have just started this NeuroMag to restore brain functions, including vision problems, anxiety, as well as bodily functions . Two days after starting NeuroMag, I amazingly, immediately felt much better, but have now read several articles that this Threonate is also severely addictive. I am scared out of my wits. Sulpiride is known to cause brain damage, so the last addiction has caused my problems.